First things first, if you’re coming to Cusco for an authentic Peruvian experience, you have come to the wrong place. Cusco is lovely in so many ways — there’s incredible architecture, museums and churches, stellar drinking and dining options, and lots of shopping to be done on the cheap. However, Cusco is a tourist destination for and by tourists, so don’t expect too much local flare. Most people are here because they’re starting or ending a trek, using it as a home base for day trips or are just spending a few days passing through to enjoy the nightlife before carrying on. Still, it's a must-see on the Peru travel checklist, and three days is all the time you need. Here’s where to eat + drink and what to do in Cusco, Peru. Morena’s menu is a contemporary twist on Peruvian classics, and they absolutely nail it every time. The space is adorable, with bright-white walls, comfortable seating and colorful pillows... but you’re really here for the food. This is the best Peruvian in the city, and you can tell the ingredients are local and fresh. Here’s the order: ceviche, 12-hour slow-cooked pork belly, lomo saltado and the crispy fish sandwich. Everything is legendary, so bring some friends so you can try it all. Granja Heidi, named after a mule who lives on a nearby farm where much of the restaurant’s produce is sourced, is one of the best you’ll come across in this city. The farm-fresh, local menu is only matched by the friendly owner, who will help you decide what to eat after you’ve just arrived and are battling the altitude (and maybe the altitude is winning). They have a prix fixe menu of Peruvians staples here with a starter, main and a dessert for a very reasonable price, so opt for the day’s specials like beef broth or pumpkin soup, and baked trout or stuffed potato. Here, signature Peruvian dishes with a bit of upscale flare await you. Andean dishes like Alpaca and Cuy are served here, but very different from its street food equivalent — Alpaca is found in a stuffed pepper, and Cuy is baked with black mint and chiles. If you’re feeling less eccentric, there’s pumpkin soup and empanadas to start followed by a tangy pork stew that’s not to be missed. The open-air restaurant feels refined but not stuffy, and the waiters are incredibly knowledgable about the food and its origins. The pisco sours here are also some of the best you’ll have. Uchu is a very small, almost cave-like restaurant with ambient lighting and a few dark, wooden tables. The menu is all about simplicity — you order a choice of meat and/or fish, which is cooked on hot volcanic stones at your table and then served with your choice of side and an abundance of sauces. Enjoy with a bottle of sparkling wine or a deep, full-bodied red. For the comforts of home, hit Jack’s Cafe, an Australian-owned restaurant that’s open late and stays busy all day long. They do a mean all-day breakfast if that’s your sort of thing, and if not they have big, toasty sandwiches, soups, salads and wholesome mains. My advice, skip the (very long) line, order your toasty and fries to go, and bring it to the Plaza de Armas for a meal with a true view. This second-floor restaurant is everything you’d want from a half tapas bar, half sit-down eatery. What you’re after is a coveted spot in the tapas bar, where the bar wraps around the kitchen and chefs are preparing little pinxtos-style dishes. It’s much more casual here than the candlelit restaurant, so expect the vibe to follow suit. There are huge sets of peppers that hang from the walls and a chalk board menu showcasing the tapa of the day. Bites include duck prosciutto and sweet potato each atop a piece of crusty bread. The restaurants dining room menu is also available in the tapas bar, with a selection of homemade dishes and hardier selections with fish or meat. The wine list cannot be beat. This intimate wine bar is lined with Italian vintages from floor to ceiling, inviting you in to take a seat and a sample within minutes. In addition to a killer wine list, they serve meat and cheese plates and thin-crust pizzas transporting you from South America to Italy. While it may be a Peruvian departure, sometimes you just need a little cozy spot for wine. Limbus Restobar has the absolute best views of Cusco. Located in San Blas, a few staircases will bring you to new heights as you enter this open-air rooftop bar. Take a seat on the outdoor patio and watch the sunset over this beautiful city. And don’t miss the photo opp, obviously. If you’re looking for an unassuming place to hang with the locals and catch some live music, you’ve found that place in Jardin Secreto. 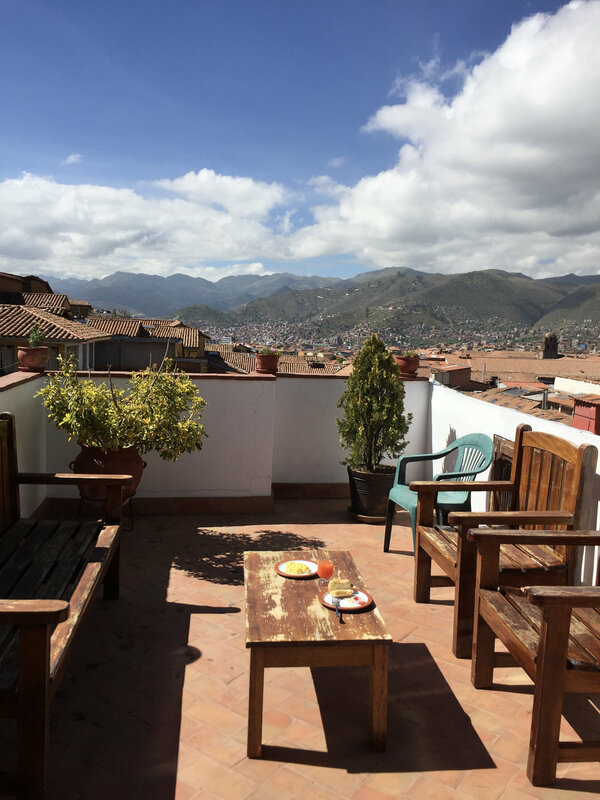 A quick jaunt from the Plaza de Armas, this courtyard-casual spot serves local dishes like lomo saltado, trout and cuy alongside some of the cheapest beers you’ll find in Cusco. Go get your drink and dance on. Okay, Fallen Angel is a little silly… but you’re on holiday, right? Come for the kitschy, over-the-top decor, stay for the bathtub fish tanks that are used as tables. You’ll get to have a fancy drink while perusing the aquarium below. Here, you’ll also see flying pigs, disco balls and baroque angels, though it feels more like a sinful paradise than a heavenly one. This in the complete ex-pat bar experience, BUT, as one of the only bars with a second-floor view of the Plaza de Armas, it’s worth it to post up on the balcony here and people-watch with a Cusquena in hand. Cusco’s main gathering square is called Plaza de Armas, and is (allegedly) one of the few squares in the world that have two churches — the Cusco Cathedral and the Church La Compania de Jesus. The beautifully-landscaped lawns and ornate buildings are a testament to the Inca’s architectural mastery. No matter the time, day or night, locals and tourists congregate here to enjoy themselves, shop the markets and attend services. It’s a great place to sit and watch the foot traffic go by. San Pedro Market is the most recognized market in Cusco, and that’s in no small part due to it’s vastness. Local artisans and producers travel near and far to bring their goods here to sell, whether that’s hats and clothing made from Alpaca wool, purses and belts made from hand-dyed textiles, or traditional Peruvian foods. This is the best place in Cusco to see what fruits, vegetables and ingredients make up the typical Andean diet. Markets can be overwhelming, so just take your time and revel in all of the newness around you. Pro Tip: I would not recommend eating here if you’re about to begin a trek — you just never know how your body will react when introduced to new foods, so save this for your return to avoid any issues. The most cherished moment I had on the Inca Trail was looking up at night and seeing the stars. The sky was ablaze with stars and constellations I had never seen, and the guides did their best to call out the special ones. What I wish I did beforehand was make a visit to the planetarium to learn a little bit more about what I was seeing, so that’s my suggestion to you. The Incas were experts in astronomy and the only culture in the world to define constellations by the dark space between them as well as by the collection of stars, so enjoy a lesson before you see the real thing up close. If you’re going to visit one ruin that’s close to Cusco, make is Sacsaywaman. It’s just a 30-minute walk uphill from San Blas and feels massive, though what you’re seeing is only 20-ish % of the original citadel. Sitting atop a steep hill, this zigzagged fortress is a nice way to fill a morning. 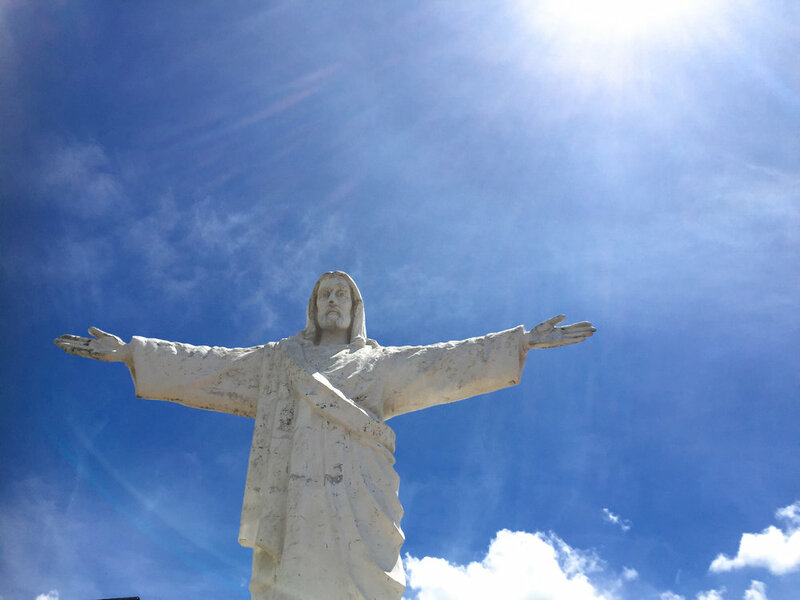 The admittedly steep hike to the Cristo Blanco statue is the same way you get to Sacsaywamán — on your left is the entrance for Sacsaywamán, and on your right, a pathway that leads to the statue. If you choose to forego the ruins (they cost money while the statue does not), you’ll get the same 180-degree view of Cusco below, with slightly more peace and quiet. This is the perfect spot to find a patch of grass and read a book, or wander the grounds to take photos. Below, you can hear the echo of crowds enjoying the city below. This is less of a museum experience and more of a way to consume handfuls of chocolate samples, but I think that’s almost better? Here, you can get a fresh cup of hot cocoa, participate in a chocolate-making workshop, or just hang around and try homemade chocolate that’s blended with coca leaves and chile. For the best day-trips from Cusco, check out this post: Best Day Trips from Cusco, Peru.